Edwin Truman recommends that the US sell all of its gold while prices are high to lower its debt. Even if the government could find buyers for that much gold, it would not even pay for a quarter of the debt accumulated so far this year. See the following post from The Mess That Greenspan Made. More evidence that there is a fundamental lack o f understanding about what gold is and why people are paying so much for it these days (and, incidentally, another reason to think that the gold bull market has a very long way yet to go) comes via this op-ed($) in the Financial Times in which Edwin Truman, a senior fellow at the Peterson Institute for International Economics in Washington D.C., recommends that the U.S. government sell its entire stock of gold while prices are high in order to help it get out of debt. Gold is back in the news. Its price is soaring in what some analysts say is a reflection of a weak economy and a lack of confidence in government policies. Naturally, investors are looking at a new sure thing in the expectation that prices will continue upward. My advice to the US government, however, is that this may be the best time – to sell. Doing so would help President Barack Obama and Congress reduce indebtedness, at little cost. The market price of gold has risen for more than a decade propelled by low interest rates, the hype of the bullion dealers (holding large inventories) and no doubt the normal amount of fraud and misinformation accompanying asset price bubbles. The Financial Times has reported that the precious metals industry expects the price to increase by a further 11 per cent over the next year. Meanwhile, the US Treasury holds 261.5m fine troy ounces of gold. The government has been sitting on it since the Great Depression, receiving no return. 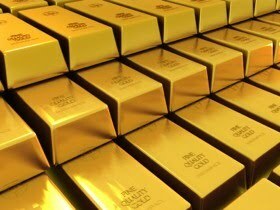 At the current market price of $1,300 per ounce, the US gold stock is worth $340bn. The Treasury secretary, with the approval of the president, has the power to sell (and buy) gold on terms that the secretary considers most beneficial to the public interest. Revenues from sales must be used to reduce the national debt. If the US were to sell its entire gold stock at the current market price, it would reduce the gross government debt by 2¼ per cent of gross domestic product. Now, the funniest part of this so far (aside from the explanation in the second paragraph above about why the gold price has been rising that just begs to be analyzed through the lens of a 21st century economist) is that, the proceeds from such a gold sale are just a drop in the bucket when it comes to paying down the U.S. debt. As if the 2.25 percent of total government debt figure as noted above isn’t ludicrous enough, consider that selling the entire 8,134 tonnes at today’s price wouldn’t even cover one-quarter of the debt that we’ve racked up just this year. And it gets even funnier from there as other benefits of the gold sale are extolled. This proposal has other benefits too. First, the US would be obeying the maxim to buy low and sell high. Second, it would be performing a socially useful function. Demand for gold exceeds normal production, driving up the price. To the extent that the gold craze is being fed by concern (rational or irrational) about government policies, public welfare would be enhanced by giving citizens something tangible to hang around their necks or place in safe deposit boxes. Third, if the price is a bubble, as seems likely, the sooner it is burst the better for the average investor. Another counter argument is that the US should hold on to its stock in anticipation of a return – by itself alone or with other nations – to a monetary system based on gold. But returning to the gold standard would reinstate a system associated with unstable prices, wages, output and employment. It has not existed for a century; and will not make a comeback. Official discussions of the reform of the international monetary system do not include any advocates of a return to gold, and the IMF articles of agreement prohibit it. The sooner thoughts of such a return are laid to rest, the better. A related argument is to keep the US gold stock as a “rainy day” precaution. But after the recent economic and financial crisis and with the prospect of misery for several more years, how much more rain must pour before the US acts? No doubt if queried on the nature of money and its role through history, like most other contemporary economists, Edwin would probably indicate that money is simply a “unit of account” and need not have anything other than a government with a crack team of economists backing it. This glaring lack of understanding is reminiscent of the naivete that Dallas Maverick’s owner Mark Cuban demonstrated a couple years ago in this item at the old blog.